Wordless Wednesday–Weed or Native Plant? 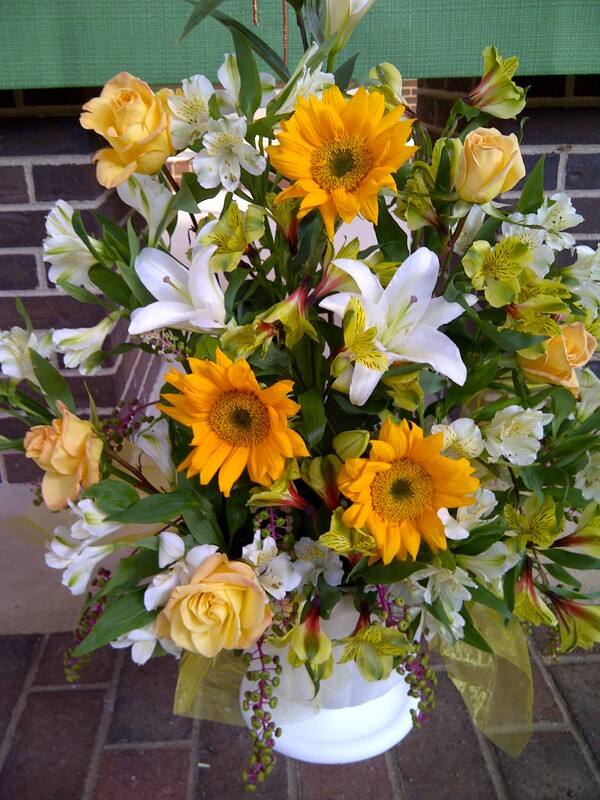 Take a close look at this seemingly formal arrangement. What is that around the base? It’s not quite ripe pokeweed (phytolacca americana) berries! I about fell out of my seat when I saw that! Talk about redefining the definition of “weed!” Or perhaps I mean “native plant,” since this plant is native to the Eastern United States. But whatever I mean, even I can’t say that I’ve ever been enlightened enough to think of these as decorative before. Then again, I’ve never been a fan of persicaria, another weed that’s been transformed into very decorative perennials, and I’m never going to be either. As I’ve always said, if we all liked the same thing, what a boring world we’d have! I actually do like pokeweed but always pull it up for fear it will take over. My former neighbor assured me it is very tasty but I never tried it. Yes, I have read and seen many recipes for “poke” or poke shoots. They scare me a little because I think you need to use them while very young. After a certain stage they become poisonous. Anything like that I tend to shy away from because I’m sure I’d pick it just one inch to long and poison everyone involved. A blogger from Cape Cod had a post last year talking about the beauty of pokeweed, with it’s pretty red stems and its deep purple berries. In theory, I do agree. I would hate for anyone to get into a death cap mushroom sort of situation with a pokeweed plant–although I’m not sure it’s that toxic. So I think that’s really my innate prejudice against pokeweed. Otherwise I’d probably be in love with it too. I’m a “weed” lover from way back! As always, thanks so much for reading and adding your comments! Funny, I miss a couple of plants of pokeweed every year, & have always used it as a bouquet filler (not as prettily as this, though). Same with persicaria. I’ve always felt bad getting rid of all of it because the bees & birds seem to enjoy it so. I guess it’s another of those one man’s weed….situations! You are so right about the ‘one man’s weed…’ saying. And about the weeds being so beneficial for the wildlife. What I think is so interesting is that birds can eat pokeweed with no ill effects but for some reason mammals can’t–and some–like cattle, aren’t smart enough to know it. Thanks, as always for reading and sharing.